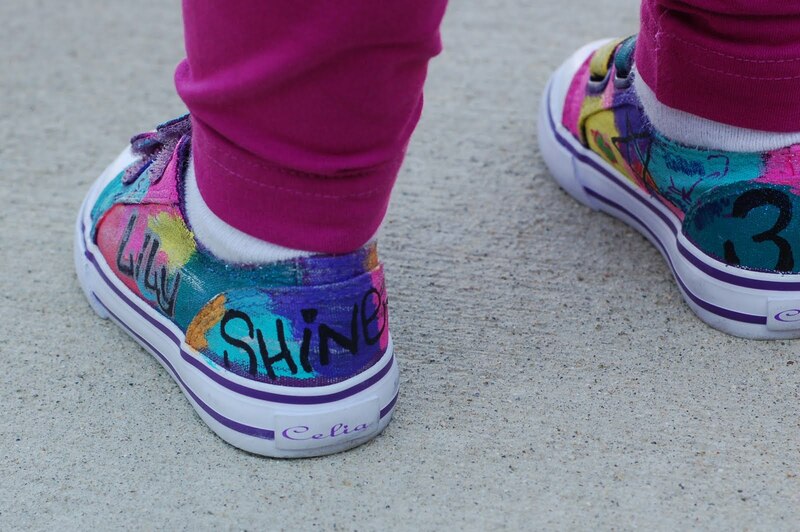 When I first saw Ashley's Graffiti Shoes tutorial at Lil Blue Boo, I knew that I had to make some for my own girls. Fast forward to a year later and I'm finally getting around to it. The hardest part of this project for me was finding the solid color canvas shoes. I wanted velcro closures and I had trouble finding them in sizes big enough for my twins. Apparently, they have large feet for their age. I finally turned to ebay, where I found several choices of brand new, solid color canvas shoes. I took Ashley's advice and started with a basecoat of white acrylic paint. I then began adding random blocks of color. After layering lots of different colors, I used a black Sharpie to add in my lettering. Then, I turned the three amigos loose and let them draw and color all over the shoes. They obviously loved this part the best. They're normally not allowed to use permanent markers, so this was a pretty big deal. At this point, I wished that I had used tape to mask off the sole of the shoe, like Ashley did. I was being lazy and just wanted to get started, so I skipped that step. It would have helped the girls, who weren't quite as careful with the markers. After the girls were done, I went back and cleaned things up a little. I added in some more words and doodles. I used a silver Sharpie to outline some of the words, which really made them more defined. Once I was happy with them, I added some clear glitter paint to select areas and let them dry overnight. All three pairs then got two coats of clear acrylic sealer and they were ready to wear! I love how personal these shoes are! 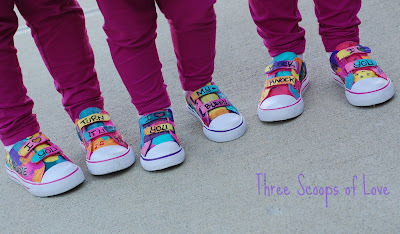 Not only do they have the girls' names, they could pick some things to write on the shoes. 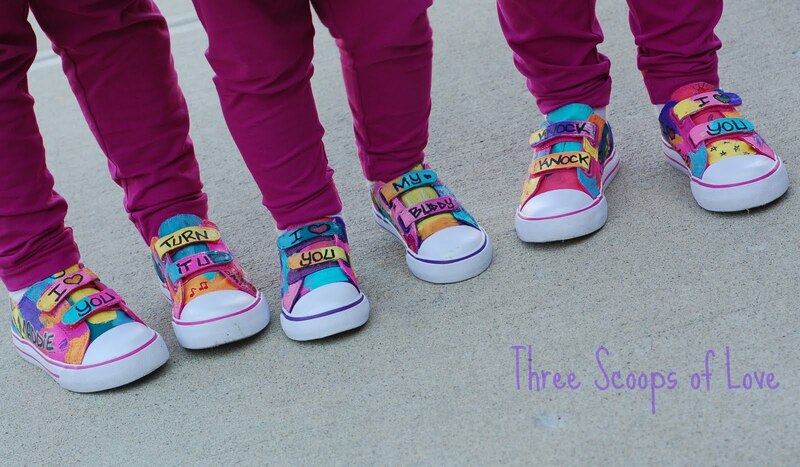 When Grace decided she wanted "I love my sisters" on her shoes, I just melted into a puddle. The more I added to the shoes, the more comfortable I got with it and the better they looked. I discovered that I liked the look of having some of the doodles and words run off the edge of the shoe. I think it looks much more interesting that way. -Take the time to tape off the sole of the shoes. It's better to spend the time masking them off, rather than trying to clean paint or permanent marker off. -You can't put too much on the shoes. Layer the paint over and over again. Keep adding more, even when you think you're finished. -I wish that I had outlined more of the words in silver Sharpie. It really made them stand out. -Even though you are covering most of the shoe in paint and marker, think about the original color of the shoe you're starting with. I think Lily's dark purple shoes turned out better because they were darker than the twins' pink shoes. -You really can't make a mistake. You can paint over anything and re-do it! SO much fun for them! Great idea! Thanks for linking up with LTC today! SO SO CUTE! And how fun that your kiddos got to help you make them! I love this idea!! Would love for you to come by my new diy fashion linky party called DIY Diva Thursdays! We party until Monday...and Id love to have more kiddo fashion linked up! These are adorable, I'm definitely going to try these with my kiddos! Your girls would LOVE Bobbi-Toads shoes. They have "toes" in the cap that you can paint with nail polish. You use nail polish remover to take it off, and you can repaint them over and over again.